Hair cuts, color, highlights, styling, updos, hair extensions, permanents, straightening, perms, facial treatments (including but not limited to microdermabrasion, glycolic acid treatments, and aromatherapy), hand and foot care, depilation (waxing), makeup application, makeup lessons, eyebrow and eyelash tint/permanent, and eyelash extensions. Breaks without fills $3 ea. Paraffin Wax - Hands $7. Paraffin Wax - Feet $12. Paraffin Wax - Face $20. Facials - 1 hour $45. 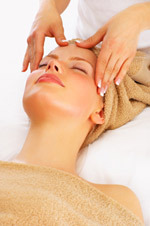 Facials - 4 layer $60. Biologe Body Mask - full body $45. Biologe Body Mask - Legs $20. Biologe Body Mask - Arms $15. Body massage 1/2 hr $45. 1 hour $ 65 1 1/2 hr $105.